When I start a room it usually has to be wrapped up within a pretty short time frame, otherwise me and Shaun try to kill eachother daily. This puts a lot of strain on me to figure out what I want ahead of schedule...because the opinion Shaun has about renovations goes like this..."Is my tv still in the room? Then do whatever you want, babe." Absolutely no help. One room that has me paralyzed by indecision is the kitchen. Or, home of the 'sorry soffits' as I like to call them. They are monstrous. Really big. They stand at 11 inches tall and a 1-2.5 inches wider than the actual cabinets. What the heck?? Ok, the height might be normal, but they seem unnecessarily big to me. 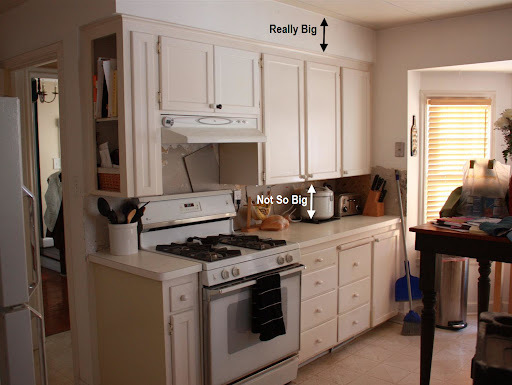 They are so long that there is hardly any space between the counter and the upper cabinets (which are 36 inches long). Alas, nary a blender, knife block, coffee maker, espresso machine or anything taller than 13 inches can fit on most of our counters. This is clearly a big issue because you all know how I feel about my coffee! I decided one day (on my lunch break of course) to put a big drill bit in my Dewalt and go to town 'exploring' what was in the soffits that required so much room. Because nothing dresses up an outfit like plaster dust. What was in these things? A place for a big screen tv? Another zip code? A rodent amusement park complete with ferris wheel? What I found was that the entire thing is framed out with extremely sturdy studs. After I stopped trying to drill into this stud (duh), I was able to peek in and see that as far as 'stuff' goes, there is only a bit of wiring for our light above the sink. No vents, no plumbing, no Ultra Screen movie theater. Whew. Also, no drywall or plaster on the wall side and hardly any insulation. Great. 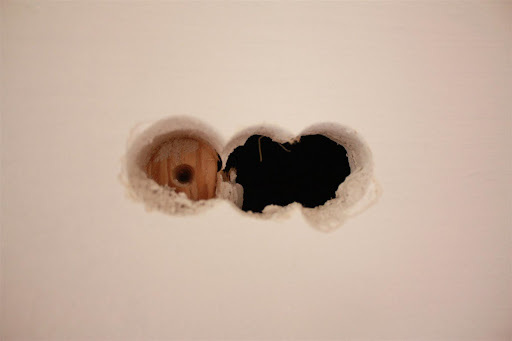 Option 1 - Hire someone to remove the 11" soffits and reattach our existing cabinets a few inches from the ceiling, bridging the gap with crown molding. 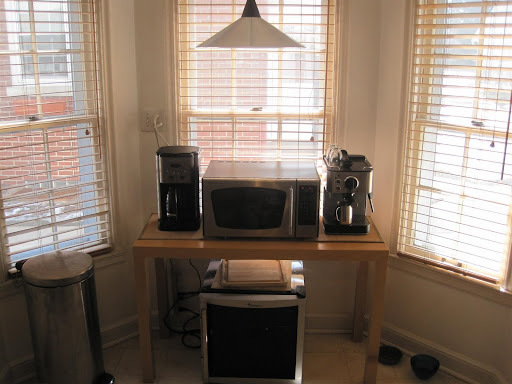 ~ My coffee maker, espresso maker and blender may all have to be crammed into the small counter space by the fridge - which may not even be there if we alter this area to accommodate a standard-sized fridge. Our current one is 30 inches wide, another what the heck problem! ~ And the biggest con, what is the point of updating all the surfaces while ignoring such a big flaw? So, what say you? 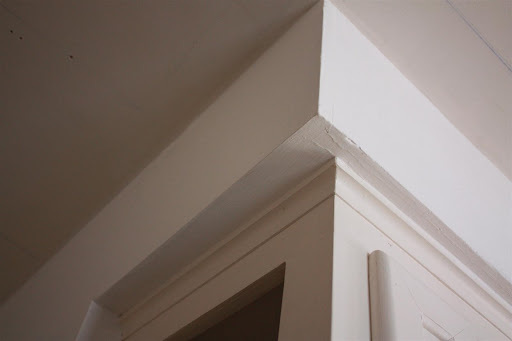 Live with the soffits or rip them out? I should mention that this is not our 'forever' house, but we do plan to stay in this house for the foreseeable future. 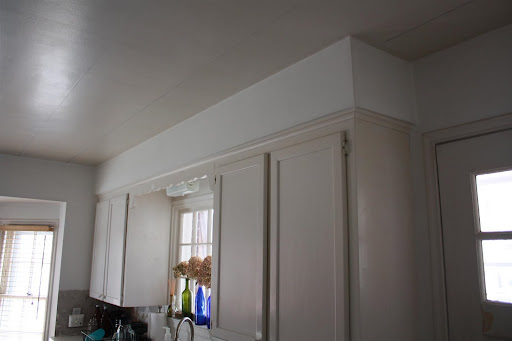 Has anyone removed a soffit but reused their existing cabinets? Rip them out! I bet you could at least do the soffit demo yourself to save some money. Little things like that, that make a room less usable, drive me batty. I think they need to go. And soon, so that you have lots of time to enjoy the added space and functionality yourself! And I agree that you can probably do a lot of the work yourself (maybe all but moving the electrical?). Don't be afraid - any gal who breaks out a spade bit on her lunch break to go spelunking in her soffits can handle a bit of careful demo! I don't think the lower ceiling above the window will look strange at all. Since it's on a separate wall, that ceiling frames the window, so it will look just fine with the cabinets raised. Oh my goodness, it's a hard one! 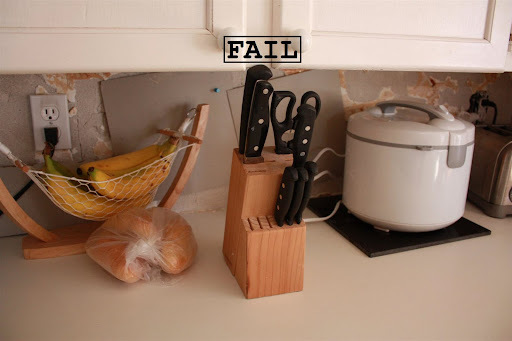 We will be facing the SAME issue if and when we redo our kitchen. When Aubrey and I were discussing it, I said..."Leave them" and Aubrey said "lets take them out". I know the whole debate as to the fact that it's not a "forever house", however, you dont want to go ahead with doing all of the other awesome updates, if you're still going to hate the fact that you left the soffits. "Resale value, home buyers may be turned off" I would cross off your list. It's amazing what we didn't notice when we walked through our house, and I wouldn't do a major change (+expense) because of the worry of resale on this one. I say get an estimate so you know exactly how much money you'd be investing in it. You may find out that it would be cheaper than you thought (or you may find out that its outrageous). If you're going to be there a while I'd say go for it, but if you don't think that you're going to live there long enough to revel in your new found space, then leave them. Sorry that's not a definite answer. First, I want to say that I am amazed at the speed in which you finish projects. You guys are fast! Now, onto the question at hand about soffits. I'm anti-appliance on the counter (even the beloved coffee maker). I store all appliances in lower cabinets, so *I* wouldn't notice the lack of appliance space. Nor would I think it odd that no appliances are displayed during a walk through. Does the lower cabinets make the counter space darker? I think that would bother me more. Another question is how long do you plan to stay in the house? If it's going to be a while, I wouldn't worry about current trends. I'd say do what *you* want and enjoy it for a long time to come. In either case, I'm sure anything you do will look wonderful. I am with you on hating soffits. We had a super annoying one in our kitchen too. We ended up hiring a professional to move all of the pipes and wires as much as they could to minimize it. I say do it! but get some quotes even if it's just to pick the brains of contractors to figure out how to get the cabinets out without wrecking them. It will be way more expensive to do it yourself if you have to replace them. And it will really give you some back-splash to make a splash with! What a dilemma! At least get some quotes on how much it would cost--maybe you'll be surprised. 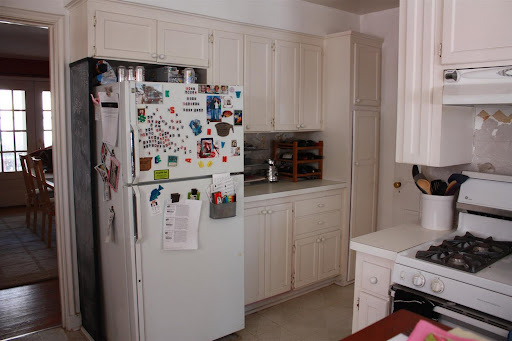 I'm all for raising the cabinets--our 41 inch tall uppers are hung 6 inches below the ceiling leaving 13 inches above the countertop, grrr--I want to raise them so bad! My vote would be option #2. You don't want to have to get on a ladder everytime you need to get a plate or glass. The only other thing would be to rip out the soffits and install new 42" cabinets, but then you're talking major bucks. So, I think for the time being option #2 is looking pretty good. Your cabinets are really pretty by the way. The standard distance from the finished floor to the bottom of your upper cabinets should be 54". I would bet that yours are lower than that and that's why your appliances aren't fitting. Huge flaw if you ask me. I'd take the soffits out and re-hang the cabinets. 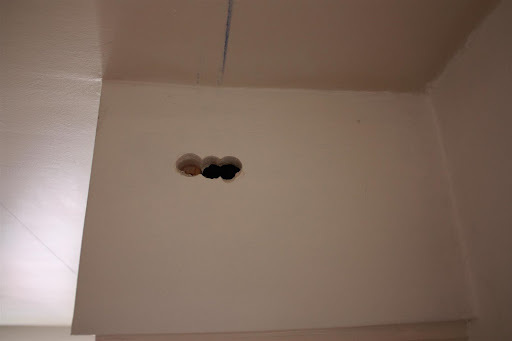 If you re-hang them at the standard height, you'll probably still have a larger gap at the top than just a moulding would cover. So you'd have to add back in a soffit or by 42" upper cabs to avoid a soffit all together. Given the additional refrigerator problem, this whole thing might be worth reconsidering. If it's not your forever house then maybe just leave it all and move onto bigger and better things in your next house! Sara, you're a handy girl- start on the job then see how it looks! My cabinets did not stay in one piece as I had planned, but they were almost 85 years old and three cabinets shared one shelf. I bet yours could take it. At least do the demo yourself- could could save big bucks. And if your cabinets start to break when you take them off, then call in a professional. As for whether or not to even do the project, I'll first just say that before reading this post I didn't even know what a soffit was (except the kind outside a house). I can now see why you don't really like it. I definitely don't think it would look weird with the dining nook ceiling lower. Honestly I don't think many people shopping for a house would even notice them, but if YOU hate it then it should be a priority. Your cabinets are good looking - but it may look kinda wonky if you re-hang them too high. Maybe you need to do some fancy photoshopping to visualize what it would look like just hanging them higher. There's no sense in going through all of that work if it's going to look like you skimped on cabinetry when it's done. I would make the decision based on how long you will be there. The housing market is crummy right now so you plan on selling in the next few years I would probably not go to the expense. If you are thinking more like 5-10 years before you move then go for it! Thanks for the thoughts everyone, I am thinking about doing what Layla @ Lettered Cottage did, she added 1x6, crown and other trim to the top of the cabs. Then I could raise them 5 inches and take care of the rest of the space (6") with the 1x6. Ideas, ideas! I don't know why I'm so scared to take out the soffits myself? I'm certainly no stranger to home challenges.....maybe because I know how expensive cabs are. My two cents is to rip them out yourself. Look at all you've tackled so far. Great news that there is nothing up in them...mine had a host of plumbing, electrical and duct work. Go for it. I say Option 1 + Option 3. Option 3 is to add in small one so that you cabinets are just the perfect height. Not too high and not too low. Of course it is extra work but in someways it is the same amount of work as removing them altogether. Good luck! We have the exact same issue in our kitchen right now. We actually had an architect come in with our contractor because we've got some serious design flaws with the current space and he says ripping them out and moving the cabinets won't be too bad on the cabinets because ours (like yours) are solid wood. 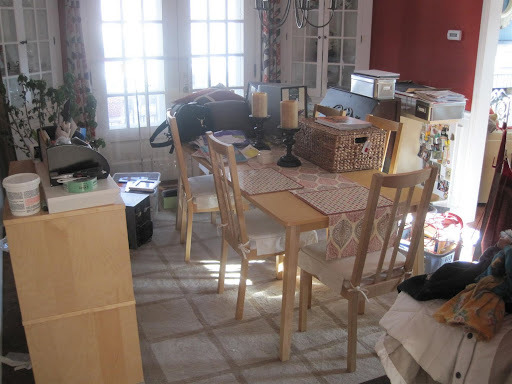 I will say that he told us that the room will look tremendously larger with the cabinets moved up. That, for us, sold it because I hate how dark it looks under our cabinets. Oh, totally follow the path of The Lettered Cottage. I love her kitchen and think that plan would really help with functionality and overall happiness. Our kitchen is hideous (Little House on the Prairie meets 1987 log cabin), and it bothers me every day. A pleasant kitchen can make such a difference! Whew! Good luck!!! I vote for the Lettered Cottage route - their kitchen is AH-MAZING! Can't wait to follow your progress!!! Sara - I say that if you think you'll be there for 5 or more years take them out. Not from a resale stand point but from a sanity standpoint. I have an amazing finish carpenter that I'm sure would be willing to come give you a quote. This guy is honest and fair to a fault when it comes to pricing up work and he's done a ton of work for me (and may be building my house!). I wouldn't hesitate to recommend him to anyone. Let me know if you want his info! I was going to suggest the Layla way but you beat me to it. Remove the cabinets yourself, either remove the soffits or have someone else do it, hang the cabinets so there is the standard 18" between the counter and the uppers, and build up the top like Layla did. Then everything is at a normal height and you shouldn't need any ladders. Take them out take them out take them out take them out take them out take them out take them out take them out take them out take them out take them out take them out take them out take them out take them out take them out take them out take them out take them out take them out take them out take them out take them out take them out take them out take them out take them out take them out take them out take them out take them out take them out take them out take them out take them out take them out take them out take them out take them out take them out take them out take them out. FYI - I think you should take them out. This is what remodeling dollars are for: tear these things out. If you can't use your countertops, pretty just doesn't matter. And once you've addressed the aesthetics, you will rue the impracticality of the space. They have to go. I'd say take them out. The reason I came to this decision is because I am envisioning a super cute window seat in that nook where the coffee maker is! This way, you will have room on your counters for your small appliances AND it will open the room more. DO IT! This is an actual issue of function! At the least, I'd say that you should raise them a bit because that shouldn't have too much of an impact on the structure. Thanks, everyone! Now I have to figure out when I'm going to start the demolition. If the cost is outrageous, I'd do the renovation in stages. I'd paint the cabinets and replace the countertops first. Then when I had more cash I'd do the backsplash and raise the cabinets. I think the granite will cost more than hiring a contractor for Option 1. As far as resale, I'd notice the lack of space. And a 30" fridge? Oh my! You have some fun decisions to make. I'd suggest going to a scratch and dent type outlet to save cash on the new fridge. I'd also install the backsplash myself. i agree with everyone above - take them out! 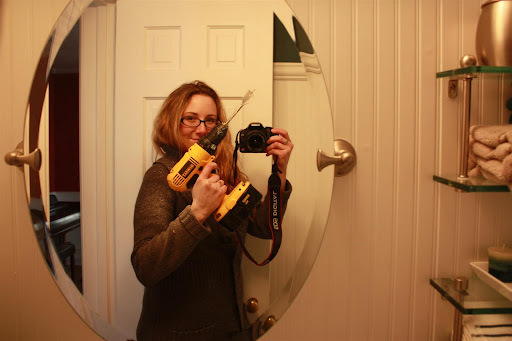 You have mad DIY skills so I bet you could handle it yourself. I think if you end up removing them it is minor but will make so much of a difference in how the kitchen feels. I know that happened when we went through the pain of doing concealed hinges in ours. It was a small (and surprisingly long and annoying) change but made such an impact on the overall room. You do everything else yourself. You have probably saved somewhere in the ballpark of, what, $60,000 by not hiring contractors to rip down wallpaper, paint yucky trim, rip up carpet, and lay flooring. I vote SPLURGE! Rip em out. Absolutely. 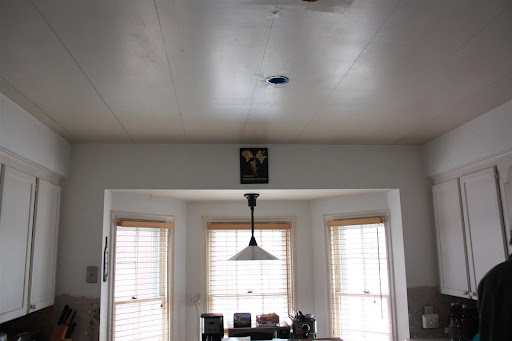 I just did a my kitchen post today and although we have many cons - one pro i like about of kitchen is our cabinets go all the way to the ceiling. I'm addressing the same issues with my kitchen - what is the point of renovating if I have to leave something that bothers me? Especially if it will be too destructive to change down the road, once the rest of the reno is complete. I guess it is a personal philosophy/budget issue, but I'd change the soffits. You could also do things in stages, to make it more affordable. The uppers are a neutral color, they could be done a year or so after the lowers/island/counter top. As for resale, I think most people don't pick apart something that looks good and fresh. If you leave the soffits, probably only you will notice. A buyer would just see something attractive and up-to-date. Definitely get a quote for taking them out. I think the cabinets will stand up to the removal, I had some flimsy ones that held up 100% and we weren't even being nice about it because we thought they would fall apart. And you're painting them anyway, right? Hi, I just found your blog via Kirstys blog and I was doing a little browsing and come upon this post. You have my soffits! My cabinets must be shorter since I have more clearance though. I am just wondering what you've done about them? I couldn't find another post on the kitchen. Did you rip them out?? Can't wait to see! oh me too, what did you do? i've got the SAME problem! !